1. the end of a long bone, usually wider than the shaft, and either entirely cartilaginous or separated from the shaft by a cartilaginous disk. 2. part of a bone formed from a secondary center of ossification, commonly found at the ends of long bones, on the margins of flat bones, and at tubercles and processes; during the period of longitudinal growth, epiphyses are separated from the main portion of the bone by cartilage. adj., adj epiphys´eal. 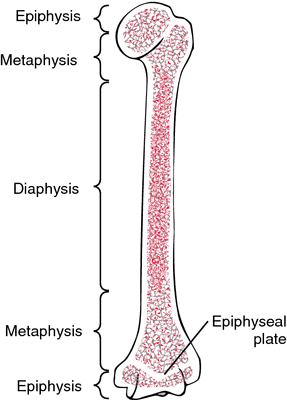 Structure and composition of a typical long bone showing the epiphysis. From Copstead, 1995. A part of a long bone developed from a secondary center of ossification, distinct from that of the shaft, and separated at first from the latter by a layer of cartilage. /epiph·y·sis/ (ĕ-pif´ĭ-sis) pl. epi´physes [Gr.] the expanded articular end of a long bone, developed from a secondary ossification center, which during the period of growth is either entirely cartilaginous or is separated from the shaft by a cartilaginous disk. annular epiphyses secondary growth centers occurring as rings at the periphery of the superior and inferior surfaces of the vertebral body. the enlarged proximal and distal ends of a long bone. See also epiphyseal plate. epiphysial [ipif′əsē′əl] , adj. A part of a long bone developed from a center of ossification distinct from that of the shaft and separated at first from the latter by a layer of cartilage. The growing sector at the end of a long bone. During the period of growth, the epiphysis is separated by a plate of CARTILAGE from the shaft of the bone. The edge of this plate nearest the shaft becomes progressively converted into bone, while the other edge develops new cartilage. 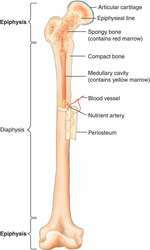 In this way, the bone lengthens. the ossified part of the end of a mammalian limb bone or vertebra which, during growth, is separated by a plate of cartilage from the rest of the ossified bone. When growth is complete the epiphysis fuses with the rest of the bone. Compare DIAPHYSIS. the end of a growing bone. Separated from the shaft by the epiphyseal cartilage, which becomes ossified to form a solid bony connection when growth ceases. Before this is complete, the junction with the shaft can be confused with a fracture line on X-ray. epiphyses pl, epiphyseal adj . Part of long bone developed from secondary center of ossification, distinct from that of the shaft, and separated at first from the latter by a layer of cartilage. n the terminal portion of a long bone. The epiphysis is separated from the diaphysis during growth by a cartilaginous zone that serves as a growth center. Once ossification unites the epiphysis with the diaphysis, growth is completed. 2. part of a bone formed from a secondary center of ossification, commonly found at the ends of long bones, on the margins of flat bones, and at tubercles and processes; during the period of growth epiphyses are separated from the main portion of the bone by cartilage. Stage 7 (PP3u): Visible union of epiphysis and diaphy-sis at proximal phalanx of middle finger (PP3). Birth trauma as the cause of fracture of the distal epiphysis of the humerus. The epiphysis, together with the growth plate, is separated from the metaphysis. Both cases showed small-sized femoral epiphysis and joint space widening. Computed tomographic studieson ossification status of medial epiphysis of clavicle: Effect of slicethickness and dose distribution. The posterior columnar artery branches off the medial femoral circumflex, which then gives rise to the lateral epiphyseal artery (LEA) that extended into the depth of the epiphysis. Epiphysis was commonly involved in Giant cell tumour. cartilage canals are in epiphysis area of bird bone and are described by Haines. 4) This indicates that UBC is a dynamic lesion, arising and growing near the epiphysis in its "active" phase. The typical radiologic findings of giant cell tumor include; a well-defined, lytic lesion located in the epiphysis with some degree of trabeculation. Stabilization with in situ pinning is the gold standard treatment for slipped capital femoral epiphysis, whether the slip is stable or unstable. Normally the upper border of the proximal fibular epiphysis is in line with the upper tibial growth plate--well inferior to the joint horizontal orientation line; whereas Blount's disease, congenital longitudinal deficiency of the tibia, and achondroplasia demonstrate relative overgrowth of the fibula, and the fibular epiphysis is more proximal, near the joint line .